Home > Beauty > What Do Your Photographer & Makeup Artist Have in Common? Hiring a professional makeup artist who complements your photographer is crucial! As a professional wedding photographer, the relationship created with a couple is critical to the success of the day. When trust is built between us and the comfort level is natural, the end result is magic. This trust goes beyond our relationship. Because of my seventeen years as a full-time wedding photographer, my couples look to me for recommendations on everything from florals to bands, and I’m happy to recommend the best wedding professionals that I’ve seen over the course of my career. But when it comes to makeup artistry, I go to the best of the best. 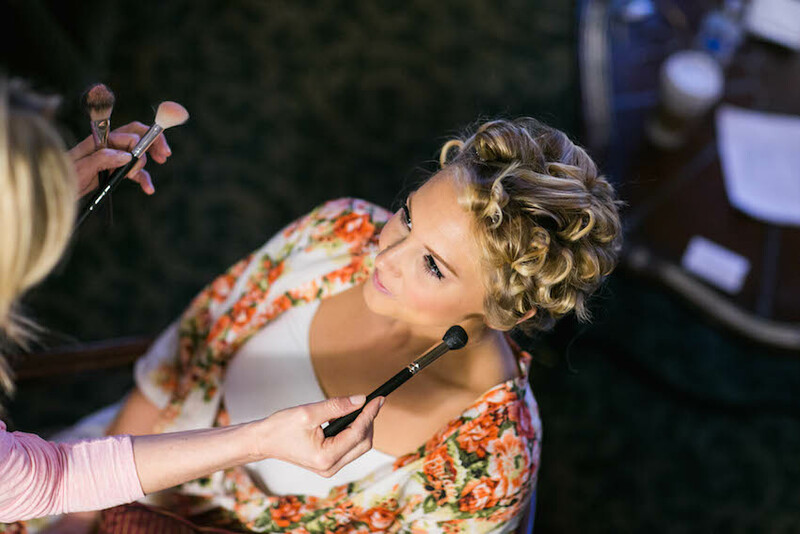 I am incredibly particular about whom I recommend for bridal makeup because when you are investing in professional photography, you want to look your best – and that means investing in a professional makeup artist. Beyond a good camaraderie, the best photographers and makeup artists should always have three things in common: a deep understanding of color theory, an intuitive knowledge of lighting, and a goal of making their bride look the absolute best on her wedding day. As a professional photographer, I am trained in color theory and lighting, and I intuitively understand how a bride’s makeup will translate on film, and a professional makeup artist will have an instinctive understanding of color theory and how the bride will photograph given the right colors and lighting. A common appreciation for how the bride will photograph and the bride's makeup as a finished product is key to a great symbiotic working relationship between a photographer and makeup artist. I recently caught up with Amy Jones Baskin, professional makeup artist and owner of Beauty on Location. Over a cup of coffee we discussed our common interests in the success of our brides' wedding days and passion for all things to do with art. We agreed that we should share these moments with you, our Inside Weddings readers! Berit: As a professional photographer, the importance of understanding color theory is crucial. As a makeup artist, how does understanding color theory benefit the bride? Amy: When I work with a bride, I see her face as a canvas. The first thing that I look at is her coloring, and I determine actions necessary to color correct. There are many tricks and nuances that go into creating a beautiful look, but a professional makeup artist will know that it’s critical to understand how colors work. Using color theory, and knowing how to apply the theory onto a facial canvas effectively, is a critical foundation for makeup success. Berit: One of the things I see that sets you apart from other makeup artists is that you actually bring with you your own lighting. I’m pleased and impressed! Amy: It surprises me that other makeup artists don’t bring their own lighting, and I think it's one of the things that separates a professional makeup artist from one that is not. Lighting is essential, and I always bring it with me. Because I travel to my clients on their wedding day, I’m never guaranteed the right lighting for work. Sometimes I end up in a room that has no windows or very low light. If I dont have the right lighting with me, I know that the look I’ll have created will not document well. Berit: What lighting do you use? Amy: I travel with a portable light and it is the same light I use in my studio during the trial. This way I have the opportunity to set an environment as similar as possible to the one we worked in initially. I use The Makeup Light. It is a dimmable daylight-balanced light source that can be used as an unimposing light alone, or as an accessory to larger light sources – even the sun. Berit: You know, that’s a great point. I’m glad to see that you understand lighting as an accessory to larger light sources, such as sunlight. I’m always amazed at photographers who do not understand the need for flash, even in the brightest of sunny days. Lighting is likely one of the most important technical aspects of photography to understand – how to use it, when to use it, and of course, when not to. Amy: I really love that about us. It truly is a team. And the results show. Berit: It’s also one of the reasons I always recommend to my brides that they consider having you come for a touch up prior to the ceremony. More often than not, brides start early in the day, hours before their ceremony. I’m documenting their getting ready moments, formal portraits, first looks, and even family pictures prior to the actual ceremony. By the time the ceremony starts, a bride may have been in makeup eight or nine hours. I always strongly encourage my brides to have a makeup artist come for a touch up prior to the ceremony and when they do, the results are amazing! When a bride’s makeup looks as good on the dance floor at 10PM as it did at 10AM, I know that they will be thrilled when they see their pictures! And that is ultimately the goal. Amy: I couldn’t agree more. The touch up is truly critical to makeup looking its absolute best given the length of the day. I always say, in the grand scheme of the wedding budget, the makeup artist is likely the smallest check you will write. But the lasting effect is what you will be seeing for a lifetime in your pictures. Amy Jones Baskin is the owner and principal makeup artist for Beauty on Location. With a career that has spanned over 20 years and included hundreds of satisfied brides, Amy is a highly sought after bridal makeup artist known for her cultivated eye and nuanced hand. Her “signature look” could be best described as fresh and flawless, but she is equally accomplished at creating a wide variety of looks such as “au natural,” “elegant glamour,” “sophisticated smokey,” and “modern.” Her mastery of airbrush makeup, brow sculpting, and brow extensions have long distinguished her as a gifted professional.